Suicide is no easy topic. So, from the outset, my apologies to my Book Chat colleague, Barry. The View on the Way Down, by 25-year-old first-time UK author Rebecca Wait, veers headlong into this uncomfortable territory. And it does not apply the brakes. The novel opens with two brothers on the beach, digging their way to 'Australia', they joke conspiratorially. Their mother is tending to her baby; their father absentmindedly scans the paper. A storm darkens the horizon. This is a Polaroid family idyll under threat. We quickly shift to the present and meet this same family — or what's left of it — in daily survival mode, visibly reeling from the suicide of one of the brothers, the eldest, Kit, some years earlier. Despite having been 'spared' the truth of her brother's death, the 'baby', now-14-year-old Emma, is rudderless, seeking more than sustenance (oblivion, perhaps?) in food and religion. Her parents Joe and Rose go about their day duly avoiding each other, as if a wrong word or glance alone can kick up the dust of painful memories. The family home is thick with absence. Kit's room remains a shrine — down to the Lego he'd left behind — yet Jamie, once the shadow of his older brother, has been all but erased. The reasons for his estrangement are both complex and heart-rending, and Wait takes her time to peel back the many layers. This, to me, seems so utterly authentic. So much about suicide centres on the unspoken; the gaping spaces in between those who are left behind. Wait is nothing if not a writer of economy. In unpacking grief, there's no sign of platitudes. Her intentions are clear. Without a filter we must see compassion with new eyes. And there's nothing comfortable, or comforting, about what we see. Yes, the terror — Wait never once allows us to forget what it means to exist in the echo of suicide — but this isn't a joyless novel; far from it. Even in the deepest recesses of grief, joy can surprise and interrupt. That's its nature. This is a quiet, unassuming devastation, which merely tilts towards renewal. And it's all the more real for it. The 'access all areas' closeness of artists' loved ones leads to potential grist for the mill. Life informs art; so, too, depression establishes a beachhead for the numbing isolation that harrows, and grief shapes the experience of joy. I state the obvious, Jen, because author Wait acknowledges a debt to her parents 'for enduring with me the dark time that led to this novel'. I agree with you, that The View on the Way Down has serious spiritual and emotional grunt, flowing from Wait's insights into lives moulded by loss and suffering. I have to confess, however, that your choice of Wait's work was initially unwelcome. Like many, I know and love people who struggle with depression. I've lost friends to suicide. Melodrama unintended, depression was my constant companion at times and suicide an alluring, far country. Tempus fugit, hey Jen? The joys, hurts, panic attacks etc, that Wait nourishes remind us that suicide does not stop with an individual's death. But while time decidedly refuses to heal all wounds, temporal distance and the comfort (literally, to 'share strength') of those we love do help us gain perspective. Moments of plot revelation touch on profundity; insights into characters' approaches to history and the cyclical nature of existence transcend mundanity. I got goosebumps as Wait's prose resonated truth. I think Wait's triumph, through superb characterisation, well-shuffled narration and a genuine gift with dialogue, is in adorning the pillars that pioneering sociologist David Émile Durkheim identified long ago as sheltering people from the prospect of suicide: friendship, family and faith. Home and hope. She promises no easy paths or answers, taking us on one family's journey. Mental ill health manifested in acute anxiety, depression and other stress-related illnesses is endemic throughout Australia; almost half the nation's kids suffer from the same. 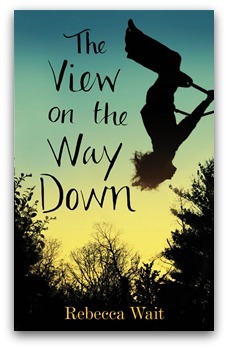 In light of its literary merits and realistic approach to the subject, I believe The View on the Way Down to be timely, powerful, therapeutic and courageous. I lost a niece to suicide when she was 34. She was my goddaughter. Echoes is a wonderful metaphor for the ongoing consequences. And a book that helps live through the loss of a family member through suicide is 'Living Death' by Janis Tait, Indra Publishing, 2005. Wiliam Styron's "Darkness Visible" certainly has helped many in understanding depression, and fostering compassion. Stéphanie loses her legs in a workplace accident. Alain is a single father who becomes her confidante. Their sexual encounters are shown to restore and affirm her dignity; they highlight the physicality of the act, particularly how Stéphanie's confidence in her own changed body flourishes through it. We have wished to invade Australia like you'd never imagined from where we are based in Pakistan and Afghanistan, countries reduced by hegemony to hell. We ruled the waves till we were in sight of an island that looked from afar like a welcome entity.